I think from a historical point of view, it'll be great to have the films completely restored as they were shown on the first day of their original release. Just having the content assembled correctly will be great, even with the original Fox logos and the original main titles. budwhite and JediJoker like this. Simon A, Oatsdad and chilinvilin like this. No doubt the fans will go even crazier with a 4K HDR release, because when you see a film with highlights that are six to ten times brighter than anything ever released before, they're going to complain that a) it didn't look that way on film in the theater, b) it never looked that way on home video before, and c) the fans will insist they have a way to master it better. I don't think Disney/Lucasfilm will care, as long as the whiners spend the money and buy the boxed sets all over again. Yes it will be interesting to watch play out. I was initially really doubtful about HDR being anything other than a gimmick myself, after seeing some early attempts stray really far from the theatrical presentation in overall color grade. In the last few years though, there's been a lot of really conservative HDR presentations, one of those being Last Jedi which IMO was very close to the theatrical presentation, outside of some lasers and other highlights. Lots of the A24 catalog like First Reformed and Hereditary are also very subdued in their use of HDR effects, which makes sense for the type of films they make. There have also been some great restorations of other marquee franchises, with a lot of effort put into balancing the advantages of HDR and the filmmakers intended look. People who are already getting heated over this should check out this article on Mission Impossible, and this article on Harry Potter, both of which had about as much consideration put into the transition as most fans could hope for. Also for what it's worth, Disney's recent forays into HDR reissues with The Incredibles, Lion King, and The Avengers have apparently leaned very close to the Blu-Ray presentation. I think the results should be interesting for Star Wars. Perhaps the most interesting thing will be how they treat Episode II and III in 4K UHD which have a pretty flat early digital look, and are locked at 1080p. longdist01 and budwhite like this. Color grading straying from the theatrical presentation has been more of the rule than the exception long before HDR, especially for re-releases on new media. Star Wars certainly isn't the only series, where directors altered the look of a film for later releases. For example the extended editions of LOTR got a new color grading with a noticeable strong green cast for the bluray release, the Wachowski's did the same to the original Matrix film once they introduced a green cast for the sequels, and the 4K master created for Raiders of the Lost Ark for the 30th anniversary was replaced by a rushed new 4K master with DNR galore, and a color grading that bordered on orange and teal. Freelance_Philosopher, CrazyCatz, tmsorosk and 3 others like this. This particular one was recently dialed way back under DP Bill Pope's supervision for the new 4K UHD disc, which looks far better IMO. So I think it's a two way street with new grades for films, as an opportunity to get it right again. longdist01, Plan9, DrDre and 1 other person like this. Good to know, I ordered the Matrix UHD a couple of days ago. Again: how do you believe something was "matched to 35mm"? You're not matching to 35mm... you're matching to a scan of the 35mm. And what kind of print was it? When was it made? How do you know the print hasn't faded in 38 years? How can you believe what you see? I have had situations where studio execs have booked me on a remastering job and asked me to meet them at a screening room to look at a library print. At least 1/3 of the time, we've gotten a few minutes into the screening, realized the print had gone magenta or extremely unstable and faded completely to hell, and we just stop the projector and shrug our shoulders and shake our heads. The exec usually apologizes for the bad print and says, "hey, look -- just make it look reasonable, OK? Use your best judgement, and I'll come in to sign off on the final." That's the best anybody can do. In cases of very important A-list movies, there will be 1980s or 1990s video transfers (even standard def) where the director and DP absolutely supervised and approved every frame, and we try to at least get 90-95% in the ballpark of those decisions. But the prints are often of no use because of age, time, and the the nature of chemical deterioration. Even if we scanned a frame or two, what kind of light was used? How was the scanner adjusted? What if the blue channel was 3 times higher than the red? What if the scan was much too dark? Do you begin to see the problem? This way, we could momentarily run a minute or two of a scene, remember how that looked, and then kill that projector and start working on the video color. We couldn't really have both up at the same time, because each interfered with the other, the white color temperature was different, the illumination was different, the base temperature of film is different, and there's a different "feel" to reflected light (from a film screen) vs. direct light (from a monitor). That having been said, at least we got the gist of it. I did this a few dozen times with TV trailers of feature films when the director wanted the TV commercials to get close to the color and brightness of the feature. But we're talking about a brand-new print right out of the lab, where they would use a densitometer and timing strips to verify that the print was accurate. Any old print would not do, because for all we know it would be 3 points -Red and 5 points +Blue and 2 points +Green, which would be (let me use a technical term) F'd Up. If it was within a point or two, that was considered good enough. (8 points roughly represents one full exposure stop.) If it was a 37 year old print of Raiders of the Lost Ark... good god. 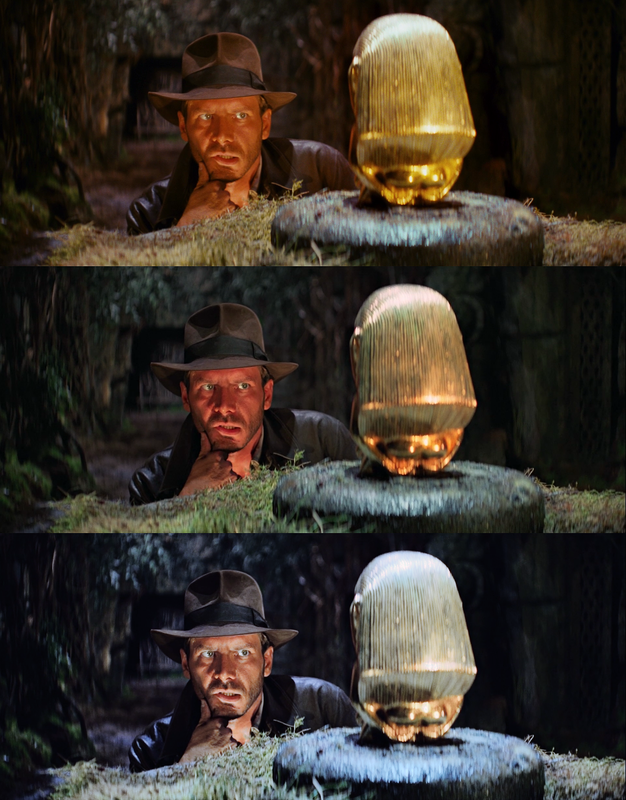 BTW, for the record as far as I know, Lou Levinson at Modern Videofilm did the original 1981 analog home video transfer of Raiders (pan/scan only), then he did it again about 6 or 7 years later (to digital D1), and then a few years after that did a new digital letterbox transfer using the previous ones as a reference. Spielberg and DP Doug Slocombe approved and signed off on all of it. I don't know about the 1997-1998 retransfers done for DVD and then the later HD versions, but it's very possible Levinson did them again when he was at the Panasonic HD Center at Universal (now Universal DVS). The first three versions were all done from IP; the others were done from cut camera negative on Arri XT pin-registered scanners. Simon A, supermd, FACE OF BOE and 6 others like this. Bill Pope is a super guy, very knowledge and really sharp. Generally, DPs are not emotionally involved with color: they have a better grasp of how it originally looked, because the director is going to have a subjective response based on story, character, and how the film feels in a modern world. Simon A, chilinvilin, Plan9 and 3 others like this. In this case the print, which was from a limited 1982 re-release, and was printed on a stable LPP stock, unlike the original 1981 release, which have pretty much all faded red. 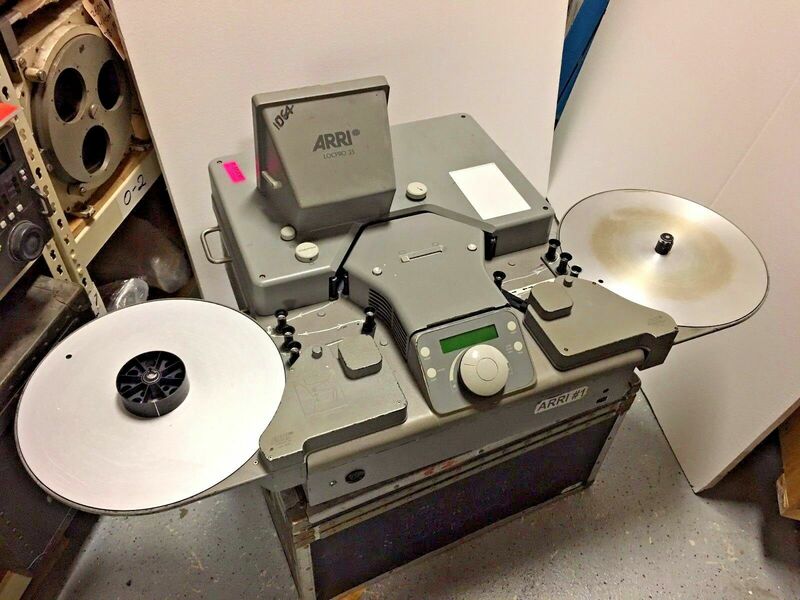 The print looked in excellent condition when projected, with no noticeable color cast, good white balance, and we were able to confirm the colors, by comparing it to a pristine 16mm print, which showed pretty much the exact the same colors for all six reels. The scan was corrected using the projected print as a reference. Freelance_Philosopher, budwhite and JediJoker like this. Makes sense with the DP vs directors. I will say I totally get the directors impulse to keep creating whenever brought back into the project. There’s no creative piece I don’t want to change myself when I'm compiling my portfolio lol. As a creative I have a lot more sympathy for directors who alter their own works than most fanboy types do. As a creative I have a lot more sympathy for directors who alter their own works than most fanboy types do. When I worked on Manhunter for Michael Mann, he was insisted that he had made bad decisions in the 1980s and that the film looked "dated," and so he made quite a few drastic color decisions on that film when we remastered it for HD. But since he co-wrote, co-produced, directed, and operated one of the cameras on the film, it's hard to argue with that. I'm not buying into that because your methodology is flawed. There's a lot of science to restoration (in addition to art), and you're basically saying "we eyeballed it." Did you read what I said earlier about the difficulty in matching projected film to digital video? Technical things aside, don't you think the fanmade examples that Dre posted looks better than the official ones? If you remixed a rock album that the artist personally recorded, would it be better? Or would it just be different? If you remastered an album that @Steve Hoffman mastered, are you making it better? Or are you just making it different? And in the case of Star Wars, can you trust the screen captures that are being shown? So far, they don't gibe with my memory of what we saw in the control room. (I've already explained the difference between Video and Full-range data levels, and there's often discrepancies there when people rip Blu-ray or DVD images.) There are only a handful of things on which I'll fight directors tooth and nail, and one of them is crushing black detail, which I'm absolutely not a fan of. "Dark" doesn't mean "crushed." I thought the Blu-ray of Raiders... looked damn good, as did the remastered DVD version before it; Spielberg isn't a revisionist in the usual sense of the term, and is pretty consistent with keeping his films to original intentions for any re-release... but the fact is that every time you remaster a film (especially if it's a scan from camera negative, necessitating a brand new color timing from scratch! ), it's going to be different than any version before it, precisely because the mastering process is dependent on a million different decisions made at the time that add up to a variable result compared to what came before... that's one thing I've learned listening to @Vidiot since I came aboard on this forum; masterings - audio or visual - are like snowflakes, no two are exactly alike, and (in the case of film) often very different to theatrical prints, previous home video releases, etc. supermd, chilinvilin and zombiemodernist like this. It's not only screen shots, the films look that way in motion too. I have them and have watch them multiple times. I'm aware of that. However, you are again making assumptions about methodology. I have stated previously, that for most of the projects I've been involved in or witness to, the color corrections were done by professionals, who do digital film restoration on a daily basis, and have both the education and experience to produce the best results. Having said that, I will admit the color correction in this instance was not done by a professional, but by an experienced amateur. However, while the results will certainly not be as accurate as when it is done professionally, I don't buy the argument that with the right tools, and a keen eye for color and contrast, you cannot at least approach the colors seen projected to a better degree than a professional who did the color grading without the intent of faithfully recreating the theatrical look, or worse with the purpose of creating a revisionist look like orange and teal. Even amateurs can for example notice the yellow soft look of the Tatooine scenes seen on a projected print of Star Wars, and conclude that the bluray has replaced that with a much cooler, sharper contrasty, and saturated look. 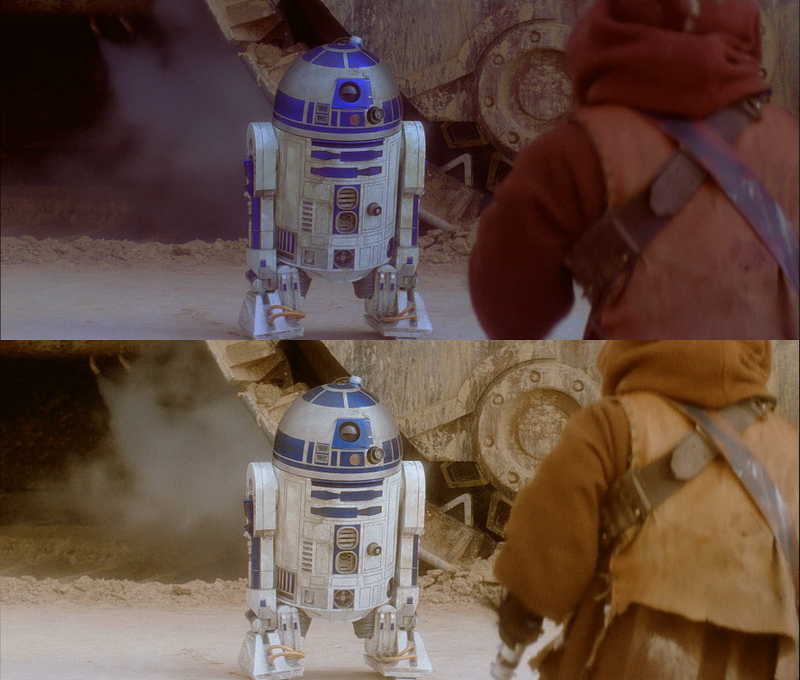 You don't have to be a professional to notice that the skies, which used to be almost gray due to the warm color grading of the Tatooine scenes, are now a deep rich blue on the bluray. An amateur can thus use the tools at his or her disposal to dial back the blue, and saturation in an attempt to bring the colors more in line with what is seen on film, or start from a reference that's already closer to the theatrical look, and use software like the one I created to match the colors. 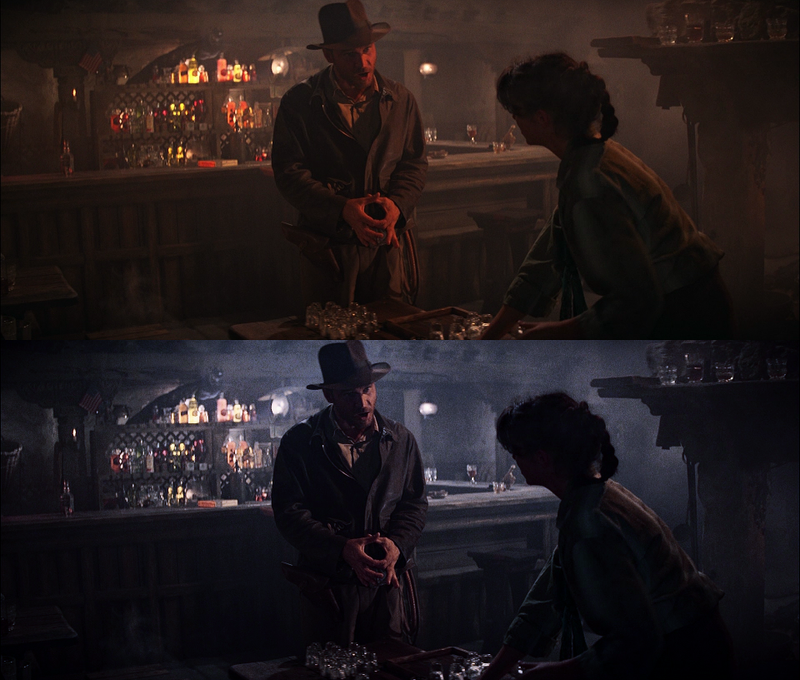 As I stated and demonstrated before, the color artifacts seen for the ANH bluray, and lightsabers are symptomatic of an altered look of the film. Bringing the colors more in line with what many percieve to be the colors seen on prints obliterates these color artifacts. This is no accident. It's simple science. I hypothesise the color artifacts are caused by a push in blue and magenta coupled with increased saturation, I find the proper references, that do not display the same symptoms, and correct the bluray to see these symptoms magically disappear. This is what we call circumstantial evidence. Let's not forget, that historically there have been numerous examples in many fields, where a dedicated amateur with a willingness to learn has produced better results than a paid professional constrained by time or other factors. While the professional may generally have the better cards, this does not always guarantee a better outcome. Yes, you have done well, Padwan. Every time something is remastered, it does get changed a little bit. I know a guy who was asked to remaster Roger Rabbit for Disney, and they demanded that it be exactly like the original 1988 master... except in HD. He went through heaven and earth and spent about 6-7 weeks on it, and the Disney people came in and watched the whole thing as a split-screen and kibbutzed endlessly about it. But they were ultimately happy with the results and it really looked beautiful; that was the late, great Mike Bellamy of Cinesite. I did the mastering on the short cartoons with the Blu-ray, and those came out pretty well. When you have years and years of experience, you like to think that you can make minor changes that ultimately make the image better. In a lot of cases, when you're looking at a 20 or 30-year-old version, the scanning technology is so much better now, the image is going to be a lot sharper and there's going to be a lot more detail in the image. I just finished remastering a certain title that came out on European Blu-ray about 6-7 years ago, and I tried to lean towards making things about 5-6% brighter (because I felt the original was a little bit muddy), and I also bumped up the lower mids a little bit (because I thought the original was a little crushed). But other than that, the overall color was very similar. My thought was, well, if anybody does any split-screens on this, most of the time they'll say the new American Blu-ray looks better. But it's not a night-and-day difference -- it's more subtle than that. But the visual improvements are something that can't be ignored. And speaking of Ignore, I believe we've added yet another name to that list (a member of the peanut gallery earlier in this thread). supermd, The Hermit and tmsorosk like this. I just want to add that the Indiana Jones blu-ray box is pretty damn good for the most part. It's the Star Wars blu-ray's that I never watch. Mostly because I don't like the Special Editions that Lucas keep on changing for every new release. That, and the weird colors and the somewhat lackluster new soundmixes.. The only way to watch the originals is if you buy the 2006 non anamorphic DVDs or the old Laserdiscs on fleebay. valvehead and JediJoker like this. The top bluray frame does not have any noticeable color artifacts, so far so good, but there's an obvious blue cast to the frame, as if it was shot late in the evening. Additionally R2-D2's blue panels are a fluorescent blue not consistent with the technicolor print references used by fans, or just about any other reference you can think of, like previous home video releases, production photos, and color accurate replicas. Vidiot would argue, that our eyes somehow decieve us, and in the translation from the big screen to the small screen what appears to look like the bottom frame will somehow end up looking like the top frame. We should thus trust the professional's judgement and memory over fans who know what R2-D2 looked like for the first film, right down to the type and color paint used for his blue panels, over fans who actually own technicolor prints, 1997 SE prints, and 16mm prints, and assure us the bluray looks nothing like what they see on their projection screens, and over other professionals in the digital film restoration industry, who agree with the critical fans' assessment, and provide them with color corrected references for their projects. We should abandon logic, and dismiss the evidence of our own eyes, because we can't produce standards, or produce professional credentials. We should ignore screwed up lightsaber effects, color artifacts, and inverted audio channels, because despite the evidence that the release was rushed, and quality control failed in several instances, the professional can't be wrong. Gems-A-Bems, JediJoker, Plan9 and 6 others like this. coffeetime, JediJoker, Plan9 and 4 others like this. In my opinion, and I have been reading this thread for a while now, Vidiot has provided the answer, albeit involuntarily, when he said this: "At some point, you have to realise it's not your movie." The way I see it, and judging by his persistent responses here, he is just incapable of coming out and plainly stating the obvious: the blu rays are an half assed, revisionist job. JediJoker, DrDre, budwhite and 1 other person like this. The new color timing does, however, make Star Wars more closely resemble the other five films in the series, especially the latter ones shot by David Tattersall, BSC. And there's the key to the whole sorry SW DVD/Blu-ray saga; when Lucas approved the new color timing for the Special Editions, there was no prequels as yet, and certainly no high-contrast/saturated digital cinematography, he relied on the original Technicolor prints for the timing on those releases... but cut to 2003-04 when he had the prequels all but completely shot and digital cinematography on it's feet, he clearly and evidently wanted to match the OT with the PT. JediJoker, Plan9, DrDre and 2 others like this. The new color timing does, however, make Star Wars more closely resemble the other five films in the series, especially the latter ones shot by David Tattersall, BSC. Nevertheless, this change was jolting. Part of me hopes this homogenization craze is over. The Mission Impossible and Harry Potter UHD sets I referenced earlier did a great job of preserving each film's unique look. Not to mention Disney seems to allow a good degree of creative latitude between each film they have made, even the saga films. Dan Mindel / Stefan Sonnenfeld's look on Force Awakens is pretty radically different from Steve Yedlin / Walter Volpatto's look on Last Jedi. Not to mention the Greig Fraser and Bradford Young had a night and day difference between Solo and Rouge One. so which one is the 'correct' one?